Seven new rikishi have appeared on this banzuke. We can also now say that it's not only the young newcomers, since the one who won this mae-zumo is already 22 years old, which is a relatively advanced age for entry into sumo. The average height of these newcomers is 1.77 m and is distributed equally, but the distribution of weight is worthy of notice. The weights range from 68 kg to 140 kg, so the heaviest recruit is more than twice the weight of the lightest! One is tempted to say that 68 kilos is pretty low and that if Asayamashita does not gain some weight he risks regular losses by direct push-outs. Additionally, it is notable that he is a former night-club host. Before presenting himself in mae-zumo two months ago, he had already gained 10 kilos since the beginning of his training, and it is more than likely that he has gained several kilos more since then. Several of the newcomers have already changed their shikona. These are the second Ozaki and Tajima, who now carry the shikona Yutoyama and Daiseishin, respectively. The table does not list the man who finished second in the mae-zumo tournament. That is Fukaya, and the reason is that he dropped off the banzuke because he got injured in his first bout in January and did not appear again in March. 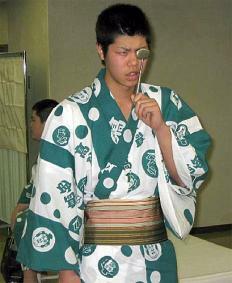 Considering his rank at the moment of injury, it was determined that he should pass a mae-zumo tournament again. His highest rank was jonidan 93 west. Table listing ranks, shikona, real names, birth dates, heights, weights and heya of the new recruits.